If I haven't told you, or you haven't figured it out, FALL IS IN THE AIR. I am so happy and so is my electric bill. Although I am pretty sure my roomate may not be when I leave all the windows open, the house fan on, and we wake up to a beautiful and comfortable 58 degrees in my house. I think that is completely acceptable though because if I could, I would live in sweatpants and hoodies. Those are the two most important advances in fashion in the history of man kind. Better than shoes, suits, hats, gloves or anything else you name. The existence alone of hoodies made my life significantly better and brought way more joy to my life; so for that reason, they win. And sweatpants, not the creepy gym teacher kind, but the comfortable, baggy, and non creepy kind are just too good to even have an accurate adjective to describe them. So for that reason, I won't try. Now if you are still reading, you may be completely confused as to why I was talking about sweatpants and hoodies. In my head, there is definitely a path to where I will connect it with this recipe, but my ADD might take over way before then. Anyways, I think my train of thought was something along the lines of it was freezing in my house, I was comfortably being a scrub lounging around and I wanted something warm and hearty to fill me up after I drank my amazing Spiced Apple Wassail. With that being said, I went to my refrigerator to peek what I had, and then it hit me. I had the worlds most important ingredient,BACON, turned around a saw a butternut squash and proceeded to steal an apple from my roomate to make this happen. Then it happened and voila. I think I did it. First paragraph was about hoodies and sweatpants, second was about the recipe, and this one is me tying it together. Woot woot I completed a thought without leaving you hanging. I would reach back and pat myself on the back, but it hurts too much after I got the whole thing tattooed the other day. It looks pretty sick though, let me know if you want to see a picture and I will post one up. I lost my thoughts again because in case you didn't realize, tattooes have nothing to do this this recipe but I am going to save it right here. It is also a genius idea. I think that it should be fall year round so I can have an excuse to wear sweats non stop and eat warm foods loaded with bacon. We should make that happen or I should move to a mountain. Neither are going to happen so I will just keep cranking my air conditioning down and pretending it's fall outside. With that being said, I have killed enough of your brain cells this morning so enjoy. **The seasonings are highly dependent on the size of your squash. My squash was huge, at least 2-3 pounds so add your seasonings in batches and taste test along the way so you don't overpower the soup. I followed the advice of many commenters and used only a smidgeon of cinnamon and nutmeg. Next time I will omit these completely, as the apple makes it sweet already. I added a bit of cayenne, put a handful of spinach in the bottom of the bowl ( covered with a plate for a couple of minutes and it cooked from the heat of the soup) and garnished with bacon and scallions. The added savory flavors helped tone the sweetness down and created the perfect combo of flavors. YUM! This would be delicious with pork chops instead of the traditional apple sauce. Thanks! I made this soup for dinner. It was absolutely delicious and I will definitely make it again. I did reduce the spices a little and I stirred in some kale at the end. It was incredible!! Thank you! Just made it. Thanksgiving side. Had to sub some sweet potato as I didn’t have enough squash (I can get it already cubed!) Wish I would have used the Granny Smith I had but went with a Fugi. Going to thin it out with a little apple juice I think. Don’t want to use more chicken stock – I had to add quite a bit. It’s delicious though! Did not test my carrots after roasting for 35 minutes, which was a mistake. I think for most carrots, the roasting time should be increased to an hour (even if they are cut into fairly small chunks). Fought with that pot of soup for an hour, alternately trying to cook the carrot pieces and shred them sufficiently with the immersion blender. Finally got it basically cooked. I agree with the comments about the spices being overwhelming, too. I would reduce both cinnamon and nutmeg to 1/2 tablespoon. Or instead add just 1 tablespoon of garam masala or curry powder. I thought it approached a curry flavor, but missing the cumin. My soup turned brown after adding the spices, which was disappointing. Also agree about not being able to taste the veggies. This soup was great! I did not blend the soup after cooking, as I do not have an hand held blender, but it was still great! Did not add in the cinnamon or nutmeg, but just salt and pepper. Will definitely make this again! This recipe is great. I made it exactly how it is stated. I think next time, though, I will reduce the amount of cinnamon and nutmeg. I think if your spices are fresh, you’ll find that the taste is a little overwhelming and you can’t taste the flavor of the butternut squash itself. I will definitely be making this again using 1/2 tbsp cinnamon and 1/2 tbsp nutmeg. It’s a keeper. This soup is to die for. I swear, I could eat it every week and not get sick of it! Is really supposed to be a tablespoon of nutmeg and cinnamon? George, this recipe is amazing!! I’ve never cooked or tasted butternut squash and was delighted by it. I actually didn’t use the bacon for garnish but blended it in with the soup and it was so good! I will be making this in the future! What are the nutritional facts on this? Like how many calories and such? Do you keep track of that? Thanks again for the recipe!! Really in love with it!! You’re welcome :) glad you enjoyed it! Ok, how in the world did you cut, peel, and chop a 2-3 lb butternut squash, as well as prepping all the other ingredients, in 15 minutes? I must be using the wrong knife…so do you have any tips for peeling & chopping a raw b-nut squash? It’s all about the knife ;) it took me a few years to really master preparing vegetables. Keep those blades sharp. What would you use an a replacement for coconut oil? i’m allergic to it. I’d grab some ghee or grass-fed butter instead. What kind of apple did you use? It looks kind of like a granny smith in the picture, often use these for baking, but wondering if a sweeter apple would add a different taste? Also, I have a HUGE organic butternut squash, how do you go about peeling it before baking it? I’ve always roasted squash by halving it and cooking in a baking dish filled about an inch of water and covered in foil. Super excited to try this! Oh my goodness… this is heaven in a bowl. I pureed the bacon in with the soup, and used apple instead of pear. Didn’t have coconut milk, used a bit of heavy cream. It was sweet, it was smoky, it was SO GOOD. This is going into the regular rotation! That’s a great idea. I always approve adding bacon to ANYTHING! Yes! Delicious. Just sorry I didn’t double the recipe! Made this soup tonight for a “not-so-sure-what-she’s-getting-me-into” boyfriend. Needless to say, there won’t be any to freeze; there’s probably two bowls left. Winner winner, butternut squash dinner! Yum! Thank you! Made this last night and it was ridiculously flipping amazing. There’s leftovers in the fridge, but that’s only because there’s just 2 of us and I didn’t think it would be a wise idea to eat the entire batch of soup in one go. LOL. That said, when it came time to “simmer” for the final step, the soup was so thick that even on the lowest setting, air built up and soup bubbles formed and popped (because it was too thick to really simmer properly)… and a schlop of soup landed on my finger and gave me a pretty bad burn (it’s blistered up this morning, eeew!). But seriously… WORTH IT. I’d just suggest that if someone makes it and it’s quite thick, to have a care in that final step just in case!!! We ate the leftovers last night and as weird as it sounds, I think it almost tasted better on day 2!!! Forgot to give it 5 stars. So here ya go! OMG i think i love you! lol new to your site and in love with everything about it! awesome stuff keep it up! btw, my 2 year old calls bacon “num num” her two favourite things are bacon and butternut squash so ill think this will be a new staple in our lives! Thank you so much! So, I have been cooking so many different variants of Butternut squash soup! Ones with sweet potato, without, ones with coconut, without, the list goes on. Then, BAM, I stumble across this sweet little creation. May I just say it is amazing! Slightly more time consuming then my other variants but it is so worth the effort! Do it now, you will not regret it! My mom and I wanted to try this, but unfortunately she is allergic to coconut. Would this still work even without the coconut ingredients? I’ve made your soup many times now, and it gets better each time! I make a large batch and freeze half for the days where I may not be able to cook/prepare meals. Thank you for your passion and dedication to health. Excited to try this now that we are GF and avoiding dairy. Pinned it to refer back to later in the week. Thanks for posting this! George, First time have made one of your recipes and this soup was great! I made a double batch as I have made various versions of butternut soup before, but never with apples and bacon. The rest should last me the better part of the work week! Thanks! Sorry for the typos, but there is no edit feature. Love love love this soup! Blows all others out of the water. Thank you so much for sharing. It has become a staple in our Paleo eatin’ household. After reading one of the comments above, I’m going to check out your brownies. I made this tonight! We haven’t sat down to dinner yet, but from the tastes I had out of the pot, it’s delicious! I didn’t have any nutmeg:( I added only a tiny but of cinnamon and some cayenne for heat. George – I wanted to let you know that my husband and I made this soup Friday night and both of us really enjoyed it. We made a large batch and froze half to have during a future busy weeknight. Thank you so much for your website and your words and your recipes. I have no idea how you juggle everything so successfully, but it is apparent that you love what you do and we love you for it! P.S. The bacon we used produced a lot of grease, but we left all of it in the pot since the recipe didn’t mention removing any. For me personally, I will remove about half next time. While it gives the soup a great flavor, it was a little overwhelming. This is in no way a negative critique of your recipe, just my personal opinion. I made this soup a couple of weeks ago. 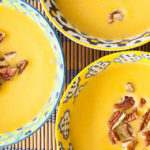 The BEST Butternut Squash soup EVER! I made it exactly according to your directions. I don’t think there is a need to change anything. With the entire family eating Paleo, it didn’t last very long. I have some cooked squash in my frig ready to make another batch in a couple days. Thank you. This recipe was great I added some minced ginger. 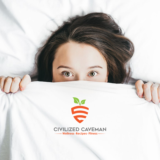 Congrats on getting featured on US Wellness Meats newsletter! This soup was a hit last night…. With the family:) even my husband who refuses to eat squash enjoyed a bowl full….. Thanks for all the great recipes. Made this tonight with a different kind of squash (not sure what it was as I’m in Switzerland and I’d never seen this one before…just said it was good for soup). Roasted the seeds and used as a topping with the crumbled bacon. It was amazing! Thanks for your great recipes! I made this for a dinner party a couple weeks ago and one of my sisters ‘begged’ that I make it again for Thanksgiving! GREAT recipe! THANKS! I made this tonight and it was absolutely delish! I have never liked squash until I started on my paleo journey, now I cannot get enough of it! George! This soup is delicious!! It took me a while to make it; I have a high maintenance 4 month old baby, but the wait was worth it :) The bacon is the icing on the cake! Thanks for a great recipe! Excellent! The only thing that differed for me was that the squash took closer to an hour to roast. Maybe the size of my chunks, who knows. The flavors are excellent. Can`t wait to freeze some for later and also taste tomorrow as a leftover. Sogood! Seriously good. I found it took a little longer than 35 to roast, but 7 mins int pressure cooker fixed that :) Will definitely be making this again. Made this last night for dinner (using my fantastic new food processor) and was blown away by the flavors! It was even better today reheated for lunch!! Awesome recipe as usual, thank you! Thanks. Making it tomorrow. I will let you know how it turns out:). Love your e-cookbook! This soup looks great, and I am getting ready to try it tonight as part of our first Whole30. I roasted a pumpkin last night, and am wondering if I could add some of that to this soup as well? Pumpkin and butternut squash should go together well, right? Absolutely delicious!!! Thank you so much for the recipe! Amazing!! I loved this recipe even though a made a poor college students version. I used olive oil and regular 2% milk instead of coconut. I made the mistake of not peeling the carrots, so I had to mash them separately after baking. Also, I don’t have a blender, so I let the mixture simmer for 30 mins and then took a hand mixer to it. Still turned out amazing!! Next time I will add the bacon pieces to the actual soup (we ended up eating all the bacon before the soup was done, haha). Thanks do much for this recipe! I haven’t even made it yet, and I am already thinking I’ll have to make double bacon! I can’t wait…it looks awesome! So I spent almost the entire weekend in noncreepy sweatpants (sans the hoody cause it was unseasonably warm in Pittsburgh this weekend) in the kitchen…in my glory. I made your fabulous soup with a few minor tweeks, cause you can do that with soup, right;) I decreased the cinnamon to 1.5 teaspoons and 1 teaspoon of nutmeg. Maybe my squash was a baby compared to yours because I love spices too. I increased the broth to 4 cups and my soup was more “soupy” than your photo. The soup was fab-u-lous topped with crispy pastured bacon goodness and will surely be in a regular rotation this winter. Thanks for the recipe love! I made this soup this evening using an acorn squash and it was delicious! I cut back on the cinnamon a bit and used some white pepper and it was really good. I can’t believe how much flavour the apple gave it too. Thanks for sharing the recipe! Fall is my favorite season. There is nothing like snuggling up in a hoodie with the windows open and a crisp breeze coming through the house (bonus points if a neighbor is burning leaves or has a fire going so you get that smell coming in, too :)). At least, there was nothing better than that until I made this soup! It is absolutely delicious and easy to make. The bacon is the perfect contrast to the sweetness of the squash. And it is the perfect addition to my perfect fall evening. Can’t wait to have leftovers for lunch tomorrow! Yoga pants, winter squashes, and autumn recipes basically make my life. My younger brother made your stuffed butternut squash and he loved it – he isn’t really into cooking so I’m always happy when he gets excited about cooking. I’ll be recommending this recipe next! Wow – I’ve got two butternut squashes and a kabocha sitting on my counter at home and one more butternut on the way with my CSA. Would it be okay to combine the two squashes, or will that give it an off texture/flavor? Also, does this freeze well? Good in concept – WAY too much cinnamon for us. Completely overpowering and spent another hour or so trying to counteract it to make it at least edible and get it to a place where it tasted like squash again. Sorry – still searching for the perfect butternut squash soup recipe. This looks killer. My younger brother made your butternut squash stuffed with beef & bacon and he loved it – he’s kind of new to cooking so anytime he gets enthusiastic I get really excited. I’ll definitely share this recipe and make it for myself too! I totally second you on comfy sweatpants & being fall all year round. Best weather, best foliage, and hands down best FOOD! Ok, the soup is deeply delicious but even more important …that tat!! Did you do it all in one session?? Ps: I really want to see the tattoo! Okay, I am bookmarking this for next week, it sounds amazing! Plus soups are always good for fall (and my baby digs ’em). Also — I blast the A/C all day so I can wear my warm clothes, true story. I didn’t know other people did that! Made this tonight for my daughter and I, and we both absolutely LOVED it! Best paleo soup I’ve made to date. She loves it so much that she asked me to pack some in her lunch tomorrow. I’ll def be making this a lot this fall and winter. Thank you! Fabulous!! I made this for lunch and it was a hit. Even the picky two-year old loved it! I didn’t have a butternut squash so made do with an acorn squash and it was still very tasty. Thank you!! Hands down the best Butternut soup I have made. Savory and seet! Followed by your pumpkin brownies I made last night…Yum, what a lunch! Five stars to both. I just bought one this weekend at our local farmers market. I couldn’t find a butternut squash soup recipe. But here is it-thank you! It looks so good! Thank you! I roasted a butternut the other day and it’s been staring at me every time I open the fridge, now I know what to do with it!